Download the latest firmware of your Linksys Smart Wi-Fi Router and save it in your computer. For instructions, click here. IMPORTANT: If the firmware you downloaded is a .zip file, you need to unzip it before you proceed with the upgrade process. 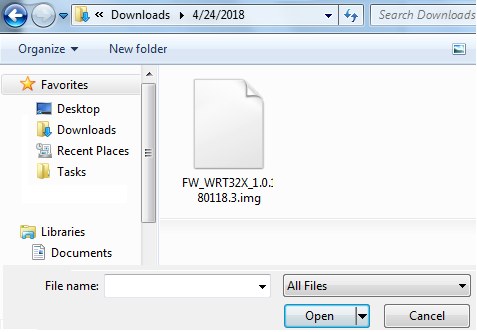 NOTE: The name of the file may vary depending on the firmware file of your device. Log in to your Linksys cloud account. For detailed instructions, click here. In the Firmware Update section, under the Basic tab, click the button. Select the file you have downloaded and click Open. 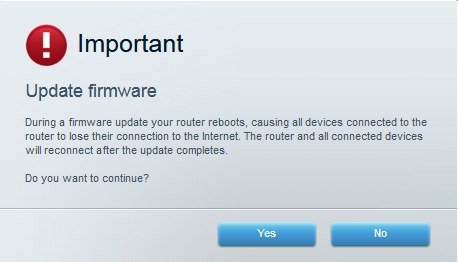 On the Update firmware pop-up box, click Yes. Your router will start updating the firmware. NOTE: During this process, do NOT turn OFF your router or close the browser window. A Router Reboot screen will pop up. Click Ok to continue. NOTE: The router reboot process usually takes a few minutes. On the Firmware update complete screen, click Ok. Your router's firmware should now be updated. Log in to your Linksys cloud account. Once the web-based setup page opens, click Connectivity. NOTE: If you don’t have a Linksys cloud account, access the router's web-based setup page by opening a web browser and entering “http://myrouter.local” or "192.168.1.1" in the Address bar and pressing [ENTER]. 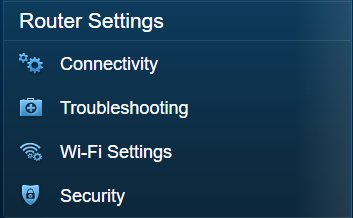 On the Linksys cloud account page, click the Connectivity. On the Basic tab, uncheck the box beside Automatic under Firmware Update then click Ok. 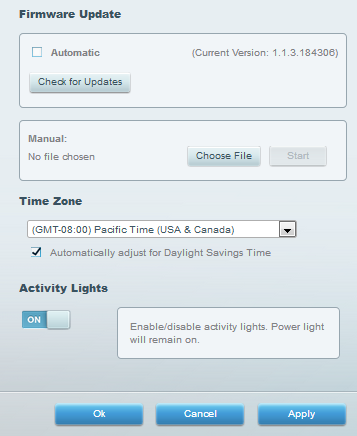 NOTE: To turn ON automatic firmware updates again, check the box beside Automatic and click Ok.